In May, we queued up the b-side of a record describing America’s balance sheet—we looked at the mix of lenders instead of the usual “a-side” analysis of the borrowers. 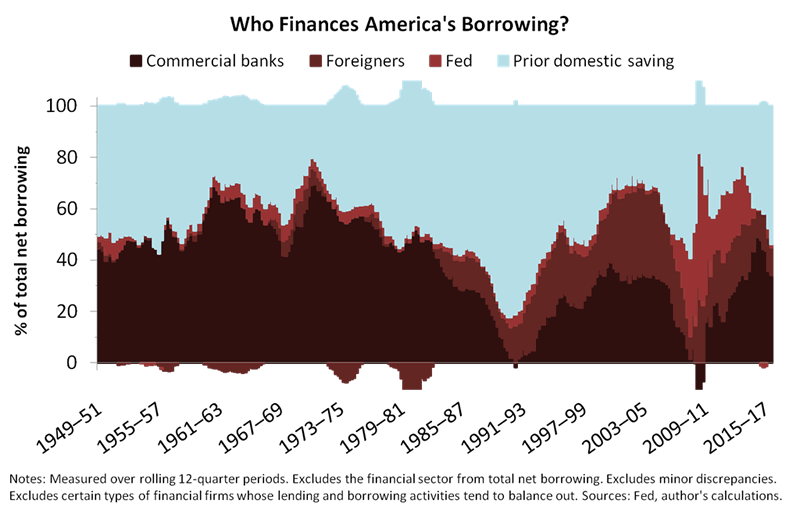 We showed that the balance sheet includes four types of lenders—banks, the Fed, foreigners and prior domestic saving—as in the updated chart below. And the “prior domestic saving” category, since you asked, is mostly households, pension funds and insurance companies investing in bonds and bond funds. Then we showed why the b-side is so important, even as it gets little attention. That is, the four types of lenders are fundamentally different from one another—lending by banks is highly correlated to spending (same-period and next-period spending), whereas the other lenders show no such correlation. But economic theory says all lending is the same—how can banks be different? Finally, we shared a diagram that explains the previous result. Bank balance sheets are also highly predictive, as we showed when we used bank credit to construct a business-cycle indicator. (Again, see the b-side article linked above.) Considering the connections—empirical and conceptual—between bank credit and the business cycle, our indicator might be the best first step to business-cycle forecasting. Okay so banks conjure spending from thin air—does anything else do the same? Real holding gains. Inflation-adjusted holding gains (household and nonprofit gains from equities, mutual funds, real estate and pensions) aggregated over four-quarter periods and expressed as a percent of final domestic demand in the prior period. And the chart below provides an example, using data from 2002 to 2008, of how we can track real new bank credit and real holding gains through a business cycle by placing one on each axis. Note that we’re mapping a path through the two dimensions by connecting data sequentially. Although the path shows just a single cycle (the last decade’s housing boom), the pattern is similar to that of the previous eight cycles, which you can confirm by reviewing the chartbook we’ll link at the end of this article. But what exactly does TSP tell us? So TSP is a creature of habit, and it has a habit of cycling through three phases: recovery, financial inflation and financial deflation. Recovery. TSP meanders upwards and rightwards as the financial economy heals from the prior recession. Financial inflation. TSP enjoys the big air of the upper-right triangle. Financial deflation. TSP completes the cycle by becoming scarce once again, dropping below a diagonal recession warning. Slope. We consider the additional spending that could result from a dollar of real new bank credit versus a dollar of real holding gains. We expect a dollar of real new bank credit to result in up to a dollar of additional spending, but probably not a full dollar due to the portion that banks invest in securities rather than loans—security purchases don’t always flow into the real economy as directly and reliably as loans do. And for real holding gains, there’s a substantial literature suggesting that each dollar of additional wealth boosts spending by anywhere from three or four cents to a little more than ten cents. So weighing up real new bank credit against real holding gains, we see a ratio of about ten to one as far as the effects on economy-wide spending, and that determines the slope of our recession-warning line. Position. We draw the line through the origin to keep it as simple as possible. That choice won’t be optimal in every cycle, but we don’t believe it’s realistic to think we can “engineer” a substantially better choice, especially as cycles change from one to the next. Note that we’re cognizant of the risks of false precision. We didn’t fit the recession-warning line using regressions or other statistical techniques—we chose nice, round numbers that seemed reasonable, conceptually, and then we stopped there. Our choices may or may not hold up in the future, but we’d rather focus on whether current dynamics could be different to the past than on data mining the past to the fifth decimal point. What can we say about the next few years? And since we mentioned it, are we expecting the dynamics to be different this time? Or, will they be the same as usual? You’ll form your own views, but our nickel’s worth of advice is to expect the usual. After eight rate hikes (and counting) and nine years of expansion, it’s natural for bankers, borrowers and asset markets to anticipate slower growth, and that’s exactly what we think we’re seeing in 2018. We’re seeing the financial economy lead the real economy. Or, to use a term that’s become popular in some circles of economics, the financial cycle is leading the business cycle. As a next step, we expect the financial cycle to fall into a more definitive contraction. So once again, the financial cycle should drag the business cycle lower, and our TSP chart offers clues about the timing. 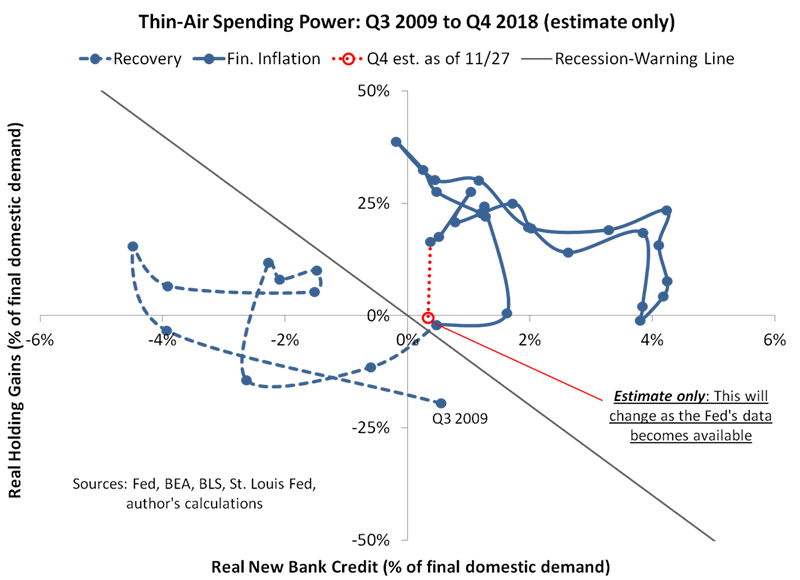 Most importantly, the diagonal recession warning provides a decent tripwire for the countdown to the business cycle’s apex. We haven’t triggered the tripwire just yet, but we get an interesting result when we use high frequency data to estimate where TSP might fall at year-end. That is, our year-end (Q4) estimate sits only just above the recession-warning line, as shown below. There is such as thing as a financial cycle (skeptics notwithstanding). 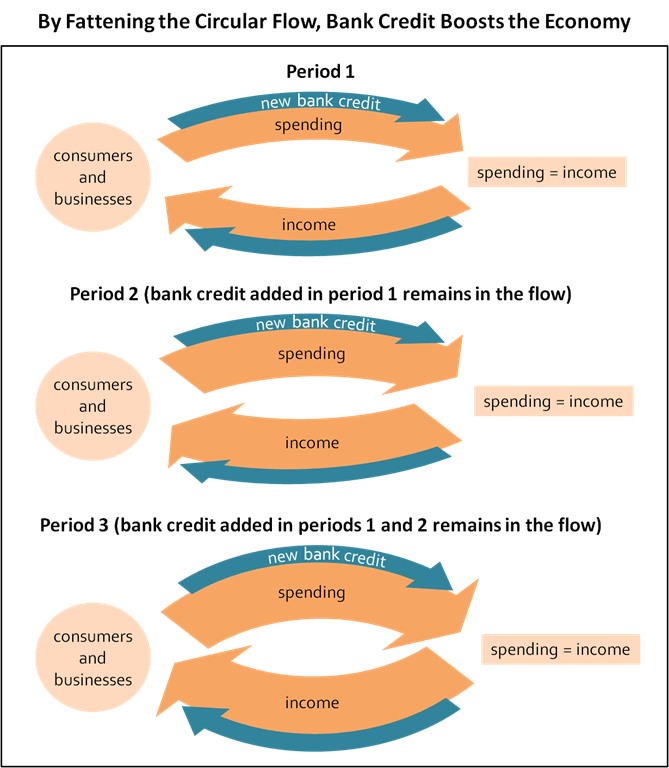 The financial cycle explains a significant portion of the business cycle. To properly account for the financial cycle, you have to first reject a handful of the most pervasive and deeply held tenets of Keynesian, Monetarist and New Classical theories. 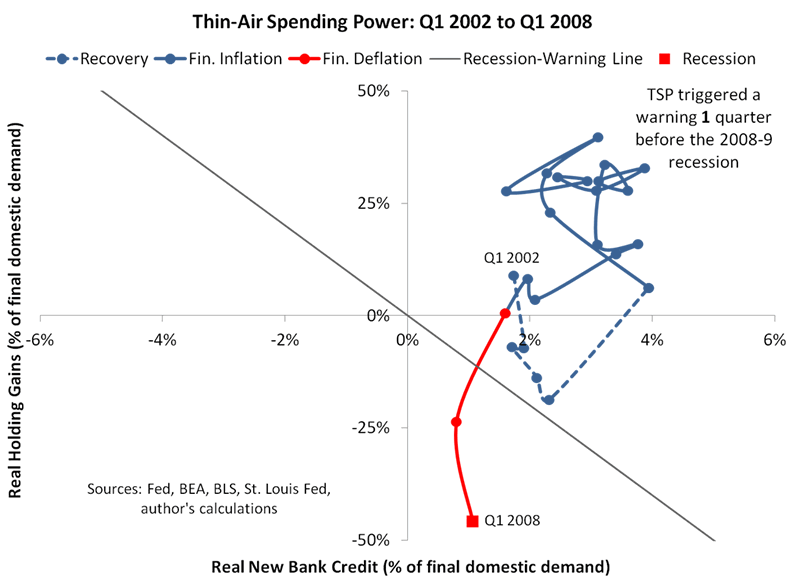 The most predictive financial-cycle indicators are those that measure spending power created from thin air, as in our TSP chart. To demonstrate the fourth point, in particular, we’ve published a chartbook with more history. The chartbook tracks TSP through every business-cycle expansion from 1954 onwards, among other charts, and shows that the two-dimensional approach has fewer anomalies than real new bank credit alone. Of course, that doesn’t necessarily make TSP better than other approaches—there are plenty of data-mined models that show ‘A’-grade back-tested results. But those models often require checking your intuition at the door, whereas our b-side approach is built mostly on intuition. In other words, we aim for indicators that extend our intuitive beliefs about how stuff works. If you’re willing to entertain that we might be onto something, check back for updates and further discussion.